We are all well aware that our ‘real’ lives are merging with our online selves, but did you know how drastically one is changing the other? This week the digital world looked at sports playing in V.R., an AI writes a screenplay, Facebook predicts the end of words (yikes), Apple, finally, let us delete apps, and we look at ‘filter bubbles’. It’s Friday time. That means 48hours of playtime ahead of you, but first end Friday with the top digital marketing picks of the week. We’re seeing a year-on-year decline of text…If I was having a bet I’d say: video, video, video. 2. An AI written screenplay, seriously. Artificial Intelligence is a thing, but can it write a screenplay? That’s exactly what Director Oscar Sharp and New York University AI researcher Ross Goodwin wanted to explore. In a psfk article they share the details and the video itself. It fails to make sense, but is still quite moving and dark. According to the article the screenplay included actor directions. This definitely should intrigue the curious. 3. You can now delete preinstalled apps. Apple will finally feed your neurotic side, and allow you to delete those preinstalled apps you really, really, really don’t want. The stuff we move to a ‘stuff’ folder so that it doesn’t insult our vision when we look at our home screens. According to the article, Apple announced at the WWDC, that they will finally be giving us the power to delete (some) of these apps. Hooray, for neurosis. 4. Minnesota Twins play with V.R. 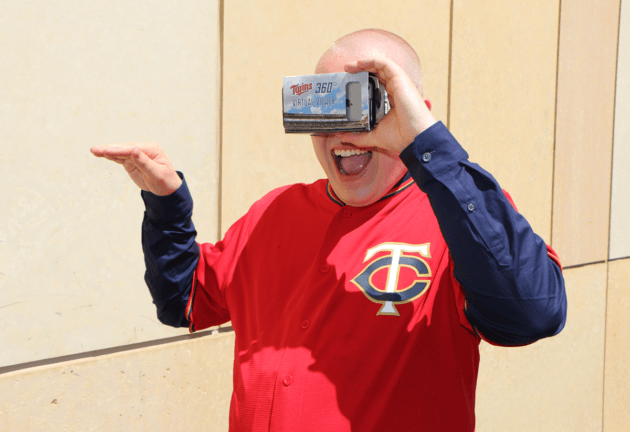 On July 29th the Minnesota Twins will be giving away 5,000 cardboard virtual reality viewers to fans, according to GeekWire. All users need to do is download the MLB.com Ballpark mobile app and “check in” to the game, they’ll be able to access virtual reality videos with the cardboard viewers and their iOS or Android smartphones. Its an exciting time for the immersion of sports and technology. This technology will allow our fans to become totally immersed within the team, giving them views into our players’ lives and routines that they would otherwise never get to experience. 5. Welcome to the filter bubble. Contently, published an interesting article this week titled: How Facebook’s Filter Buble Warped My Perception of Reality. It’s Emily Neuberger’s take on her ‘social’ world and its affect on her reality. In it she discusses the lack of a true reflection on social media due to the algorithm that ensures content personalization. She terms this reality the ‘filter bubble’ and suggests this technology is bent more to customer satisfaction than truth. There is no standard Google anymore, you can’t see how different your search results are from anyone else’s.